If I had to live on something for the rest of my life, this would probably be it. 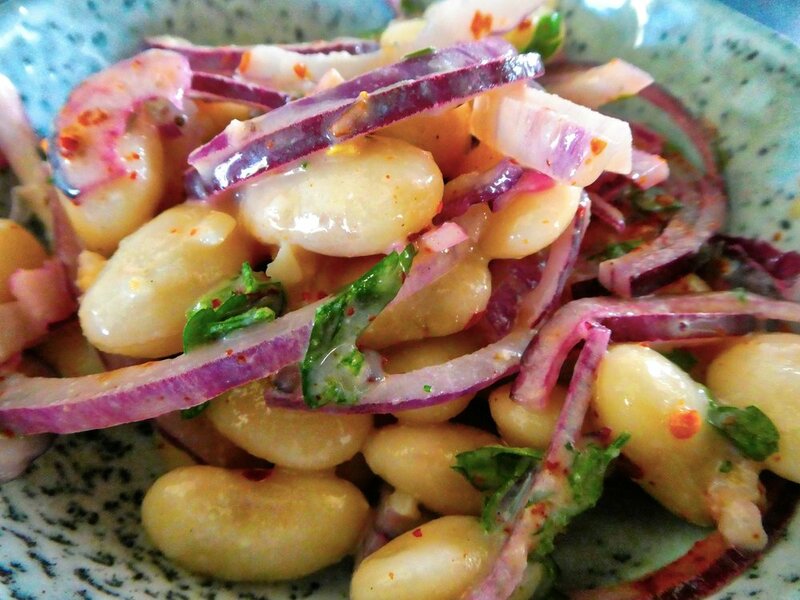 I’m growing enormous Greek gigantes beans just so I can make this delicious salad. Actually salad isn’t quite enough to describe this dish. It’s so much more than that. Take a large salad bowl and tip in the big beans, the onion, the chilli flakes and the parsley. Take another smaller bowl for the dressing. Crush the garlic and add it to the lemon juice, tahini, olive oil and vinegar. Chuck in seasalt and grind some black pepper to taste. Whizz all that together then gently incorporate it into the beans & onions. Turn everything carefully, without breaking up the beans, until it is all covered in the unctuous loveliness. I think it’s even better the second day when the flavours have melded together, so feel free to keep it in the fridge for up to 24 hours. I serve it on its own for lunch or as a side dish.